She got it goin' on. Denim miniskirt with tights and funky hightops and a colourful woolen hat and stripey gloves. 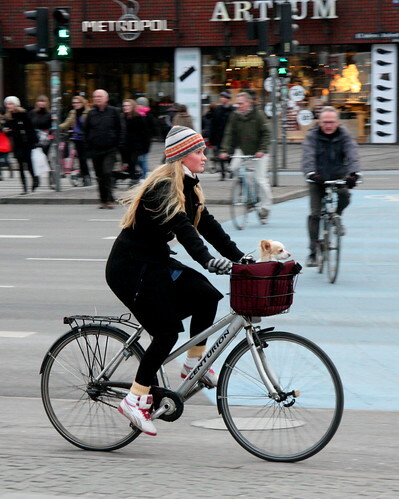 In the basket, padded against the sub-zero wind, her faithful friend enjoying the ride. AHH, another Centurion. I like that style a bit more but, that must be the American in me. She is adorable, looks so healthy and postitive. I wonder, do sometimes Copenhagen citizens recognize themselves here? Greetings from Serbia. now i mix up in the crowd and you could barely tell that i'm not a native...if i was not dark haired. i follow your blog with devotion! Beautiful, I think I may leave the warmth of California and return to Europe. She is gorgeous, the wind and cold have given her more color than normal, I'd say, and her hair is a bit tangled, but I like the effect, on her hair and her skin color too. Now that's traffic worth watching. sometimes people recognize themselves, yes. i usually send them the photo.